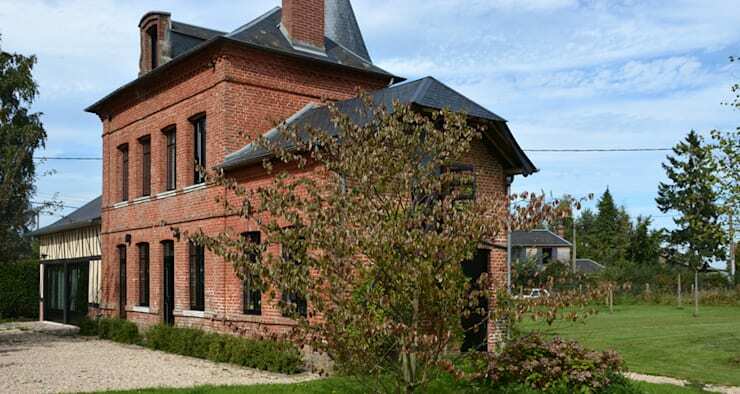 When the basic shell of a house is utterly breathtaking, it’s worth going to any lengths to save the inside from dilapidation. 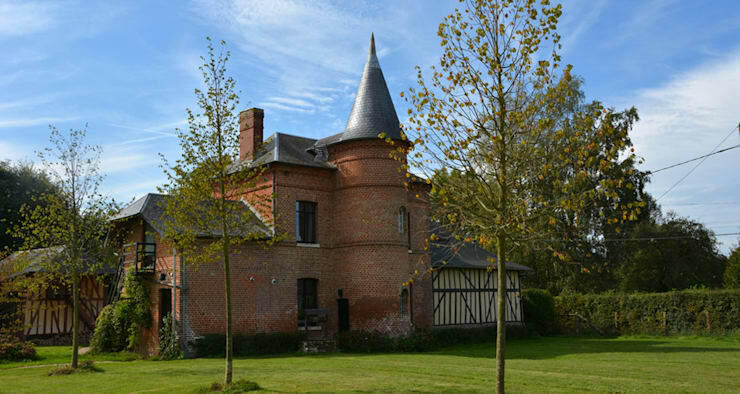 Such was the case with this absolutely drop-dead gorgeous house in Normandy, France. Interior architects Apolline Terrier saw the incredible potential that the interior of this building had and set about bringing out its unique star quality. The results were quite wonderful, as we’ll see below. There’s no denying that this building cuts an impressive silhouette, with its proudly pointed tower stretching upwards to touch the sky. Possibly even more lovely than the geometry of the house is that marvellously deep red brick that gives it such a warm and welcoming character, and contrasts so perfectly with the vibrant blue of the sky behind. From this angle, the body of the tower is concealed, but its spire is still visible rising up behind the building. The architects have been careful to capture that classic French country kitchen feel here, making liberal use of carefully aged rustic wood floors, surfaces and beams. At the same time, however, there’s a definite modern influence at work here, which prevents the room from feeling too twee or cutesy. For a start, the colour scheme has been kept extremely basic and the overall aesthetic of the space is deliberately free of clutter. 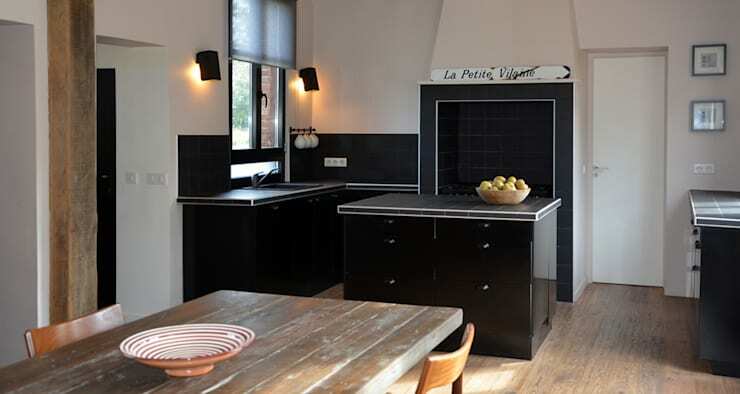 Those slightly unexpected black tiles are the perfect contemporary counterpoint to all that light-coloured wood. Just as in the kitchen, the old-fashioned character of the house itself has been retained here, but the room has clearly been updated for the modern day. 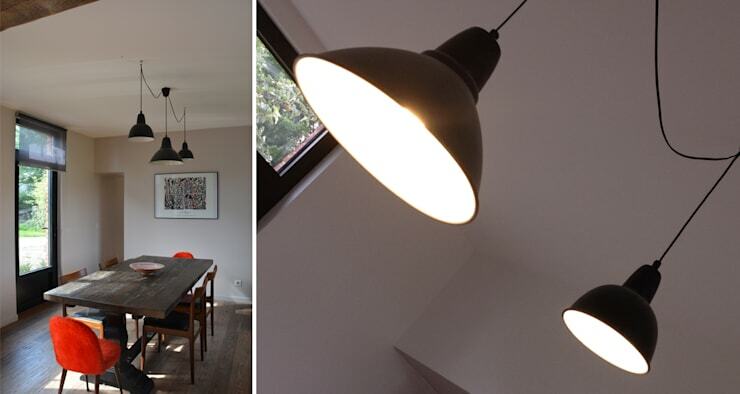 Most notably, those eye-catching pendant lights – cleverly hung at different levels for added interest – are amongst the beautifully current features that demand attention. This is probably the most daring room in the house. 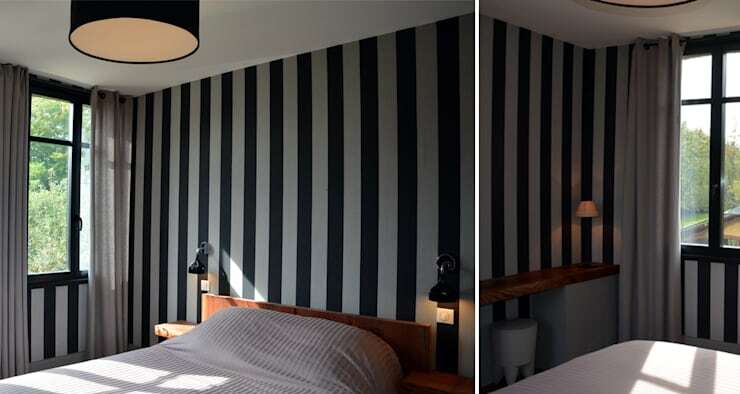 A monochrome stripy bedroom is the sort of idea one can imagine sounding really cool and unique on paper, but that once actually executed would simply become a recipe for a daily headache. Not so in this case; it really does look as cool and unique as the designers must have intended it to. There are a couple of different reasons why it works so well. Firstly , the stripes are widely-set enough that your eyes aren’t going to lose focus just from staring at the wall. Secondly, there isn’t much else going on with the room. The bedclothes are sedate, the space is free of clutter and distractions, and there are no other strong colours to lessen the impact of the monochrome walls. 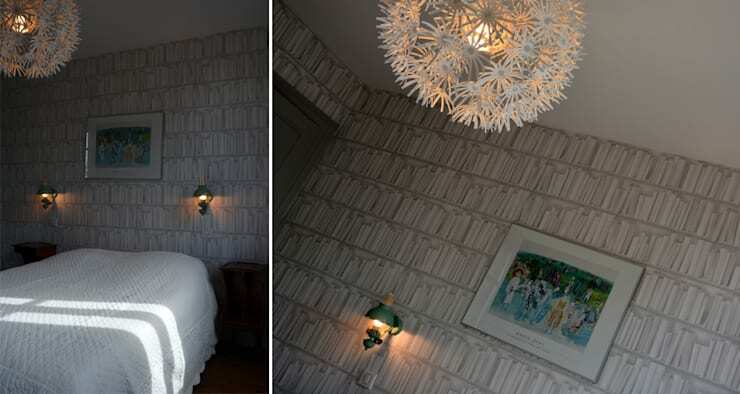 The printed wallpaper in this bedroom is far less bold than in the other one, and because of that it’s possible to get away with having more extra features. That fluffy, dandelion-like light, for example, would be far too much if it were in the stripy room; but here it works just fine. 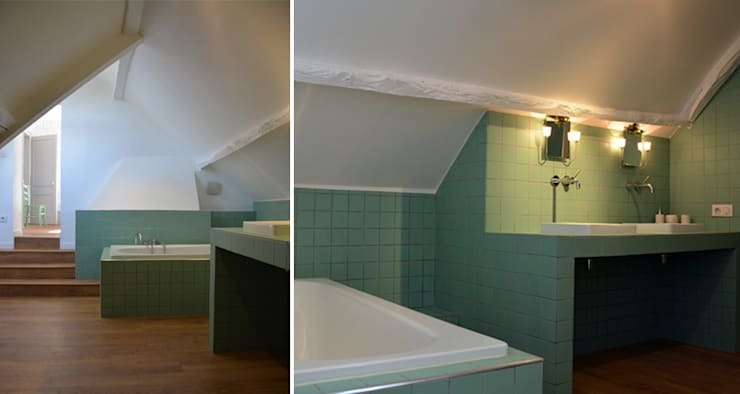 Sloping ceilings and wooden floors make this bathroom a compact, cosy refuge from the world. The mint-coloured tiles are the perfect complement to the rich tone of the flooring. 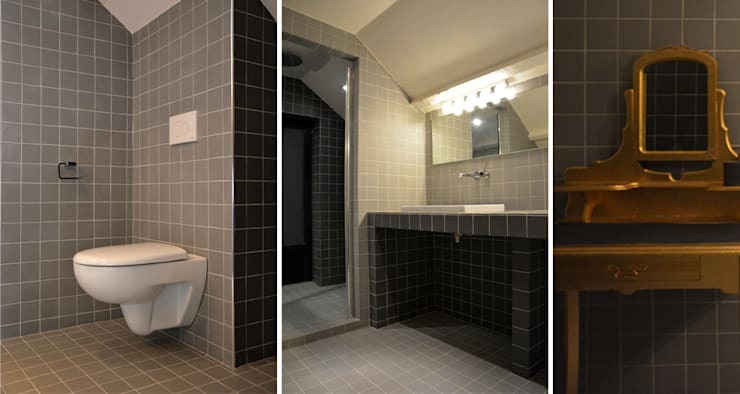 Using the same dimensions and style of tiles as in the first bathroom, but in gray and black instead of mint, creates a clear link between the two rooms and makes them feel like part of the same design family. This bright gold of the dressing table brings energy to the room, preventing it from slipping into monochrome lifelessness.